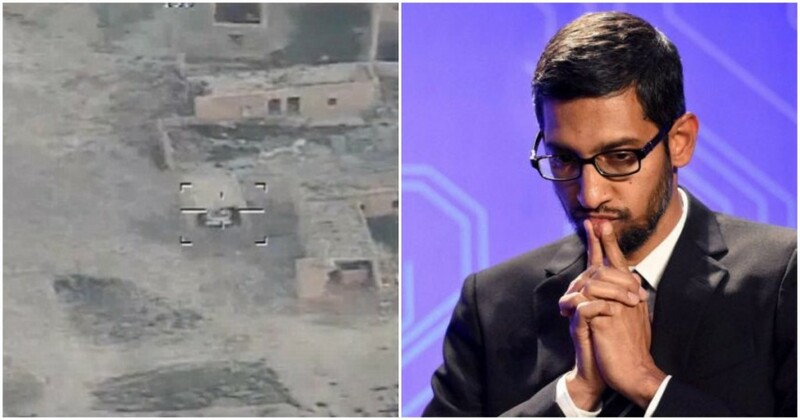 Google is facing an internal backlash for choosing to use its AI capabilities to help build military drones. As many as a dozen Google employees have resigned in protest after the company refused to back down from its support to a US project which would use Artificial Intelligence to help military drones identify their targets, reports Gizmodo. The initiative, called Project Maven, is in collaboration with the US’s Department of Defense, and seeks to better identify objects in drone footage. Google, of course, has particular expertise in the area. Over the years, the company has been honing its machine learning skills to help identify photographs, and the results are pretty spectacular. Even in its consumer-facing apps, such as Google Photos, Google can now identify and classify images and neatly sort them into categories, such as sunsets, or pets. But the uses of such identification for the US military aren’t as benign — the US government wants Google’s help to identify detect vehicles and other objects from the drone footage, track their motions, and provide results to the Department of Defense, which could then use the technology to decide whether to bomb a particular target. This had caused much unease internally at Google, and a few months ago, 4000 employees had signed a petition asking the company to pull back from its controversial program. “Dear Sundar, We believe that Google should not be in the business of war,” the memo had said while addressing CEO Sundar Pichai. “Therefore we ask that Project Maven be cancelled, and that Google draft, publicize and enforce a clear policy stating that neither Google nor its contractors will ever build warfare technology,” it added. There’s also a feeling that Google’s management doesn’t listen to its employees as it once did. “Over the last couple of months, I’ve been less and less impressed with the response and the way people’s concerns are being treated and listened to,” one of the employees who’d resigned told Gizmodo. Apart from Google employees, a group of 90 academics in artificial intelligence, ethics, and computer science have released an open letter that calls on Google to end its work on Project Maven. “We wholeheartedly support (the employees’) demand that Google terminate its contract with the DoD, and that Google and its parent company Alphabet commit not to develop military technologies and not to use the personal data that they collect for military purposes,” the letter says. It’s not hard to see why there’s such opposition to Project Maven — Google has used billions of data points from everyday photos uploaded by its users to teach its training algorithms to identify objects in images, and these algorithms have become pretty good over the years. To use this technology to help the US in its military operations doesn’t just seem strange, but also going against Google’s self-described motto of “Don’t be evil”. While Facebook and other tech companies are currently in the dock for misappropriating citizens’ data, the real misuse of technology might just be happening elsewhere. And this isn’t the first time Google’s employees are up in arms against the company’s policies — earlier this year, there had been some consternation internally over the firing of James Damore, who’d written a memo saying that men and women, on average, have different innate abilities, and it was unwise to force diversity at the company. And with over a dozen Google employees now resigning over the company’s stance on helping military technologies, Google is realizing that the bigger it gets, the harder it is becoming to keep accommodating differing viewpoints at its workplace.